Normally when I make eggplant parmesan or melanzane alla parmigiana I keep it nice and simple with nice thick slices of eggplant that are either roasted or fried and then baked in a marinara sauce and topped with melted cheese. 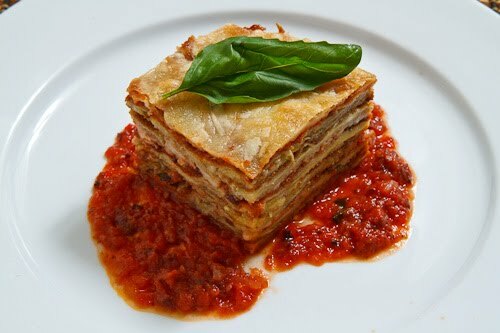 Recently I have come across several layered lasagna like versions of eggplant parmesan and despite the extra effort involved I knew that I would have to try making one and I got the chance to on the weekend. Roasted eggplant is really good and I often roast eggplant when a recipe calls for frying it to keep it a bit lighter. This time however, I wanted to go for the full on crispy breadcrumb coated version. Other than layering this eggplant parmesan the recipe is pretty much the same as my normal version, though this time I went with a kalamata olive marinara sauce to pack in even more flavour. The lasagna like layered eggplant parmesan took a bit more time to make but it was worth it! I quite enjoyed the layers of crispy coated eggplant with melted cheese and tasty marinara. Though I will likely continue to make the simpler version more often, I will definitely be making this version again! Salt the eggplant and let it sit in a colander for 20-30 minutes then rise it and pat it dry. Season the eggplant with salt and pepper, dredge it in flour, dip it in egg and dredge it in the bread crumbs. Fry the eggplant in the oil until it is golden brown on both sides and then let them drain on paper towels. Spread some of the marinara on the bottom of your baking dish followed by a layer of eggplant, some marinara, some parmigiano reggiano and mozzarella and continue to layer until you end up with cheese at the top. Bake in a preheated 350F/180C oven until the sides are bubbling and the cheese is melted and golden brown, about 20-30 minutes. Your lasagne dish looks absolutely perfect! Wow, the cuts are so perfect (again) haha. My mother would love this dish. Thanks for sharing! Yum, looks delicious I can't wait to try it out. Might have to have some friends over for this one. Eggplant parm is one of my favorite dishes, hands down. Now you went and made it into a masterpiece! I'm impressed…and hungry now! OMG Kevin that looks awesome!!!!! I absolutely love eggplant parmesan…..I just want to take a big bite out of it….LOL!!!! just delicious!! Yum! Last time I made Eggplant Parmesan it tasted awful. You have inspired me to try again! hehe 🙂 Looks great! I am truly salivating right now. What an incredible lasagna! Oh my gosh, thats all I have been saying for the past 5 minutes. I would love this! I love eggplant parm, my all time fave dish. I have never been very talented for frying though so I have never done it when making the dish, but it is my favorite way to have it! I love eggplant parm. This is a neat way to have it. Yum!! This looks absolutely delicious. I tried to make something similar, but it was not the same at all – I guess the secret is thin slices… Thanks so much for sharing! Too delicious for words….and guess what I have a few egg plants that will be ready to pick soon!! I love eggplant but never thought of making a lasagne with it. Looks beautiful and delicious. Personally, I am a HUGE eggplant parm fan. The little Italian deli near my house only sells it like this so I never even thought about doing it any other way! Love it! Eggplant Parmesan is one of my all time favourite dishes. I just melt at the thought of it, and your version here looks just delicious. This looks wonderful. I usually do eggplant Parmesan without a recipe. What goes in it depends on what I have. The picture convinced me to give yours a try! GORGEOUS dish, kevin. this is seriously one of the most appetizing things i've ever seen. I have always considered the eggplant (or aubergine, as we call it) to be on my personal list of obnoxious vegetables, much like quiabo and jiló here in Brazil. But I am curious, does this lasagna disguise it's taste and texture? I have to admit this looks damn good to eat! That looks seriously stunning. I guess I know what I'm going to et at the supermarket today! The kalamata olive marinara sauce is a nice touch!! that sure looks good. you know, i've never been able to make eggplant parm right myself. it's never as good as when I order out for it. This looks fabulous! My boyfriend's dad makes an insanely good eggplant parmesan and this is the way he makes it – layered like a lasagna. I don't think I'd want it any other way now! That looks delicious!! I do the same "lasagna style" with my chicken parm!! I will have to try it with the eggplant! this looks perfect and beautiful! Ufffffffffffff ñam ñam I´m hungry!!!!!!!!!!! Whow…I just fixed this last night. My usually picky hubby loved it. I'd made a different recipe before, but the dredging with flour wasn't included. I don't know if this was the "it" factor, but your recipe is a keeper and all others will be disposed of. Thanks. I love your blog and many of your recipes have found their way to my binder. This looks delicious! 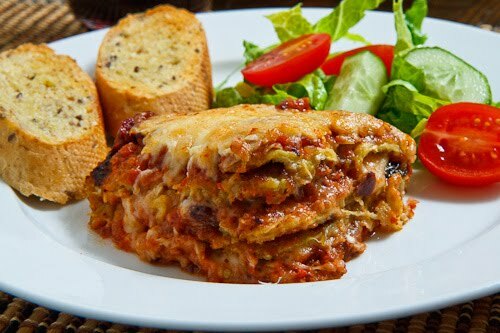 I am abig fan of all kinds of lasagne and I love the idea of eggplant in it. It's always nice to see some new ideas, thanks for sharing, I might try this recipe next time I'll make lasagne. Made this for dinner tonight and it was incredible… Thank you for sharing!! !